The spiritual father at the time of its "birth" was Rev. Theodore Mertens. Rev. Mertens had been called to act as "traveling minister" for the entire State of Iowa. As such he traversed the whole state on horseback and buckboard. On one of his many journeys through the State of Iowa, he came to the vicinity of Storm Lake, and found a few families living south of the lake that had been brought up in the Lutheran faith, but now had no church connection. With them he conducted services in the home of August Zinn. Members of eight or nine families attended these services. The first to conduct these services in town after Rev. Mertens left was Mr. Anthon Ehlers. He was then doing supply work as a vicar in Zion Lutheran congregation. He served one year, 1880‑1881. When Mr. Ehlers returned to the seminary to resume his studies, Rev. L. Craemer of Fort Dodge served Storm Lake for one year. He was succeeded by Rev. Mr. Grumm of near Aurelia, who faithfully ministered to the spiritual needs of the few families in Storm Lake for two years, 1882‑1884. Again a change was made in 1884. Mr. F.C. Leeb, another theological student from Springfield, preached in Storm Lake for a few months until relieved by the Rev. William Lauer, who had accepted a call to Crozier. The Rev. William Lauer, Pastor of Crozier, served Storm Lake from 1884 to 1888. This was a period of special importance, for under his guidance and leadership a Constitution was drawn up and then formally adopted in August of 1885. When Rev. Lauer left Crozier, he was succeeded by the Rev. L. Traub, who immediately took charge of the Storm Lake Congregation, and served the congregation from 1888 to 1893. Under his leadership the congregation conducted its first regular business meeting March 20, 1893, and also at that time rented the Lakeside Chapel, as it was then called, from the Presbyterians. Since that time, services and meetings of St. John have been held at the northwest corner of Lake Ave. and West Third. Rev. Richard Haendschke was installed as first resident pastor in September of 1905 and served until April of 1910. During his ministry here a new constitution was adopted, and the Ladies Aid was organized on June 8, 1908. Mrs. Anna Linge was the only living charter member at the 75th anniversary. Rev. E.A. Brauer served the congregation for a short period from 1911 to 1912. From 1912 to 1918 the congregation was served by the Rev. Eugene T. Lochner. Rev. Carl H. Boye of Galva served the congregation as vacancy pastor for about one‑half year, until the Rev John Hartmeister accepted the call and served from January, 1912, until May, 1927. In 1920-1921 a new brick church was built after the old Presbyterian building had been dismantled. On April 14, 1920, the Lutheran Circle was organized. In 1922 Rev. Hartmeister wrote and translated, and revised the constitution. This is still our present copy of the constitution. Rev. Hartmeister also established a regular parochial school which he taught himself for several years. Mr. Paul Brauer was called as a regular teacher and served in the school from September, 1924, to June, 1926. Despite all good efforts the school was closed and out of existence when Rev. Hartmeister accepted another call. After a short vacancy during which time the Rev. C.H. Seltz served as interim pastor, the congregation's call was accepted by the Rev. H.P. Schmidt, who served the congregation from 1927 to 1945. Not being able to revive the parochial school, he put forth all his efforts in organizing and promoting the best possible Sunday school. These efforts were crowned with considerable success, especially after a systematic S.S. Teacher Training Course was introduced. To better qualify himself for this work, the pastor went to our Normal College at River Forest, Ill., and took a special summer course in Synod's Sunday School Teacher Training Course, this being paid for by the congregation. The result was that our Sunday school flourished greatly. Saturday school and four weeks of summer school were added. Bi­class work was also introduced in the Walther League and in the Ladies Aid, and was continued throughout the 18 years of the Pastor's service. In 1929 the congregation purchased a new parsonage west of the church, 201 W. Third St. In December 1930 the Lutheran Young Peoples Society affiliated itself with the Walther League and drew up a constitution in accordance with the International Walther League. In 1939 a pipe organ was installed and other improvements made in the church. Pursuant to a resolution by the congregation the last and final German language service was conducted in the church on October 1, 1939. With encouragement by Rev. Schmidt, Paul Lemke, a member of St. John, entered the ministry, and on June 15, 1941, he presented his first sermon at St. John as the beginning of his career. In 1943 the mortgages on the church and parsonage were finally and fully paid and the congregation was entirely free of all debts. Rev. Schmidt presented his resignation on August 26, 1945, and soon moved into his own home, having served the congregation for more than 18 years. The congregation now numbered 548 baptized members, 420 communicant members, and 110 pupils in the Sunday school. Rev. A. O. Bleeke of Carroll was now called and served the congregation from November 18, 1945, until August, 1953. On February 13, 1946, the Men's Club, which is affiliated with the National L.L.L., was organized with 32 charter members present. In November of 1949 the Christian Fellowship Society was organized. A choir had always been in existence in the church, and in September of 1953 a children's choir was also organized. The church building for quite some time had been getting too small for our needs, even though double services were initiated on February 1, 1946. This did not fully solve the problem, so it was finally decided to start a second congregation in Storm Lake. A goodly number of the members of St. John now voluntarily organized the new sister congregation, Grace Lutheran Church, and erected a new church building at the corner of West Fifth and Northwestern. In August of 1953 Rev. Bleeke received and accepted a call to Hartley, Iowa. Rev. Bleeke died in August 1972. After a vacancy of some four months, during which time Rev. E. Wehrspann of Aurelia served as interim pastor, the St. John congregation called Rev. Walter F. Mueller of Terril and he was installed on January 31, 1954. The Lydia Society was organized in 1954. In July, 1954, the congregation, looking forward to the future, bought the A.E. Brunson property north of the present church and dismantled the old landmark house on it in the fall of the same year. In April, 1955, a fact‑finding committee was elected by the Voters' Assembly to investigate the needs and possibilities of St. John's, since the congregation once again had experienced a membership growth. More room and facilities were needed, especially in the Sunday school. 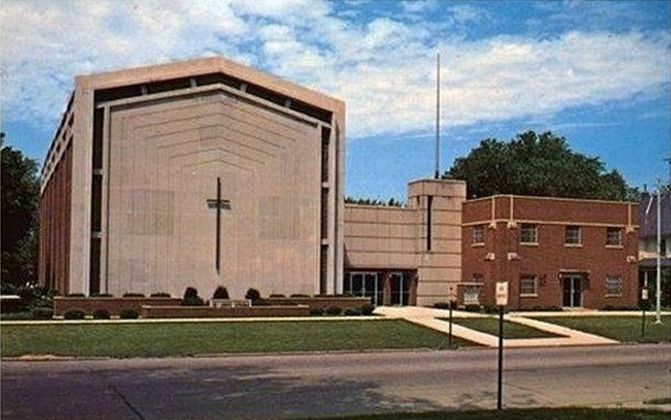 In January, 1956, five members were elected by the congregation to act as a building committee and were authorized to make contact with various architects and contractors to begin the planning and building of an educational unit to provide for the present and future needs of the congregation. In October, 1956, the CYC (Concordia Youth Club) was organized for children between grades 4 and 8 to receive additional spiritual training in religion, crafts and music. Ground breaking services for the new educational unit were conducted on March 30, 1958, and on July 20, 1958, Corner Stone Laying services were conducted. In 1958 the Ladies’ Aid observed its 50th anniversary. On April 19, 1959, the new Educational Building was dedicated to the Glory of God. The new structure was the first part of a proposed two‑unit construction program which in future years would incorporate a new church. In fact, according to plans, the building already contained one‑third of the proposed future church: the two vestibules, rear portion of the nave and overflow section of the new church, the choir loft and the church tower which already contains the church bell which was transferred from the present church. The 75th anniversary of St. John's congregation was observed at special services held Aug. 7, 1960. Preacher at the two morning services was the Rev. Harold Krueger of Lake Zurich, Ill., and liturgist was our pastor, the Rev. Walter F. Mueller. Serving as organists were Victor Vollrath and Mrs. Syril Brown. Mrs. Harvey Koth directed the choir in special selections. The afternoon preacher was the Rev. G.W. Lobeck, president Iowa District West. Organist was Mrs. Vernon Winterhof. Assisting Rev. Mueller in his work was Glenn Kalthoff of Topeka, Kans., who vicared one year beginning in August, 1962. D.A. McCullough of Minden, Neb. came as a vicar for one year in September, 1963. At the February 21, 1966, voters' assembly it was voted unanimously, 30‑0, to purchase the two lots west of the church from the Samuel Cutts estate. The lots contained an old house and the former Cutts greenhouse. This property to be used as a future parking area. In August, 1966, the congregation honored its pastor, Rev. Walter Mueller and Mrs. Mueller, on the occasion of their 25th wedding anniversary and the near completion of the pastor's 25 years in the ministry. In April, 1979, members of St. John honored Pastor Mueller with a monetary gift in appreciation of 25 years of pastoral service here in our congregation. Structural problems in several areas of the church and heating difficulties influenced the decision in November, 1966, to embark on the second phase of the building program ‑‑ to erect a new sanctuary. Original plans for the new worship center were changed and plans drawn for a church connected to the educational unit, but as a separate entity. 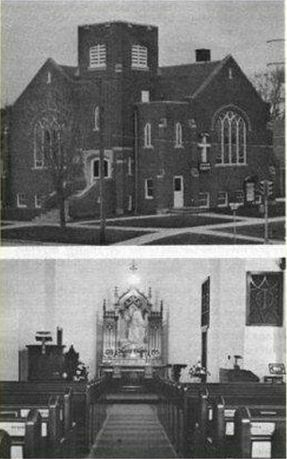 On June 11, 1967, the last services in the old church were held and members attending came to the full realization that their place of worship for 47 years would soon be demolished. Precious memories were recalled, sad times and happy occa­sions, and many eyes were misty as a result of the remembrances. During construction it was decided the interim services would be held in Fellowship Hall of the educational building. After the final service, church furnishings were removed with the altar, pulpit and baptismal font moved to the interim worship center. The pipe organ was removed to Kansas City where a firm had been given the contract for its renovation. Some pews were moved for future use in the educational unit and the curved pews to the church at Arcadia. Finally the night preceding the day demolition was to begin, the contractor gave the word that salvage by members would be permitted and many of the congregation came in to salvage a memento of their house of worship. Those who felt compelled to take one last look after the church had been stripped agreed it looked tired and worn. The north art glass window had been salvaged to be used in the new church. A large audience assembled the morning the demolition crew started its work, and the dragline picked the church apart, beginning at the east gable. After the site was cleared, stakes were soon set for the new church and pouring of footings began July 12. A unique part in the construction of the church was eight arches each containing 5,100 lbs. of steel and 1,072 cubic feet of special concrete. Each weighed 54 tons. The cornerstone laying was held Oct. 22, 1967. Members of the building committee were Walter Linge, chairman, Ralph Koskovich, Paul Wogahn, Lester Grunig and Marvin Lichtenberg. Finance committee members were Oscar A. Baumann, chairman, Richard Theesfield, Richard Stille, Arthur Hintz and Orville Luepke. Elders serving at the time of the construction were Ralph Davis, Marvin Lichtenberg, Lester Grunig, Leslie Millard and Homer Peters. The board of trustees was composed of Henry Miller, Marvin Goldsmith and Clifford Sliefert. Dedication and consecration of the new House of God was held June 30, 1968. The Rev. Dr. Ellis Nieting of Fort Dodge, president of Iowa District West, and the Rev. A.O. Bleeke of Hartley, former pastor here, were preachers with Rev. W.F. Mueller, pastor of St. John as officiant and liturgist. Organist was Mrs. Vernon Winterhof. Mrs. Harvey Koth and Mrs. Walter Mueller were choir directors. Special music by an instrumental ensemble added to the festival. The first acolytes participating in our church lit the candles on Easter Sunday, April 6, 1969. The first acolytes were Michael Dornsbach, Marlin Sievert, James Rube, David Stille, James Mueller, James Wogahn, Richard Zwemke. Their robes were made by Altar Guild members. St John's Circle noted its 50th anniversary in April, 1970. The group organized April 14, 1920, with 25 members was first known as Home Loving Club. According to its bylaws, proceeds from this group were to go to building a new church. Mrs. Paul Voit became a member in March 1929, and Mrs. Ray Biggins in June, 1937. Both are current members of our congregation and of the organization when it disbanded in 1982. The Rev. Walter Discher from Immanuel Lutheran in Estherville, who was semi‑retired, came to assist our congregation in August, 1971. He served as assistant for six years. The Rev. Discher and Mrs. Discher were honored on their 50th anniversary and of his ordination on April 16, 1978, sponsored by the congregation. They were honored at an appreciation potluck for a job well done here on October 16, 1977, upon his retirement. He was called to his heavenly home on Sept. 8, 1981. The Altar Guild decided in February, 1976, that it would be appropriate to make Chrismons to be used on the trees at Christmas in the new church. Mrs. Henry Nielsen, Guild director, appointed Mrs. Walter Linge, Mrs. Chester Brecher and Mrs. Herman Nielsen to be in charge of the project. The first class of youthful confirmands repeated their vows of service to the Lord in the new church on July 7, 1968. Eldest member of the congregation at that time was Jacob Schmidt, who was 97 on Aug. 16. He celebrated his 100th birthday at an open house three years later. The congregation celebrated its 90th anniversary with special morning and afternoon festival services on Sept. 15, 1975. Guest speaker was a former member of St. John, the Rev. Paul Lemke of Rock Rapids. By resolution of the voters assembly, beginning with the month of October, 1975, communion was offered at both services on the first and third Sundays of the month. Palms were used for the first time at Easter services in April, 1976. At the voter’s assembly in April, 1976, it was voted to call a fulltime assistant pastor. The call extended to the Rev. Harvey Hendrickson of Zion Lutheran, Woodburn, Ind., was accepted and he was installed in September, 1977, as our associate pastor. On October, 25, 1966, a group of ladies, many over 80 years of age, organized a Mission Sewing group. Of the many dedicated workers, 90‑year‑old Doretta Wogahn and Esther Linge have missed only three meetings and are still going strong. Since their beginning they have made 950 quilts, in addition to lap robes, children's clothing and other items needed in the mission field. Their goal for the centennial year is to make and tie 100 quilts. The Rev. and Mrs. Mueller vacated the parsonage in July, 1976, moving to their own home. A report on the sale of the parsonage at 201 W. Third was made at the voters meeting in October, 1977. The property was sold to Andy Parks. The congregation helped Rev. Hendrickson financially in the purchase of his home and held a first mortgage on his property. After several months of limited activity because of ill health, the Rev. Mueller reported in November, 1979, that he would not be returning full time and at the end of January would be on permanent disability. The Rev. Albert Bostelman, retired, assisted with the Lord's work in our congregation on a part‑time basis during Rev. Mueller's illness. On Jan. 27, 1980, Rev. Mueller delivered his retirement sermon. When the final payment on the mortgage on our church property was made on Nov. 10, 1981, a mortgage burning ceremony was held on Thanksgiving Day. Vicar Martin Moehring, after serving his year of vicarage at St. John's, gave his farewell sermon on June 28, 1981. The Rev. Paul Warnier of Manitowish Waters, Wisc., was ordained and installed as associate pastor on June 28, 1981. The new blue covered Lutheran Worship hymnals were dedicated at services on April 18, 1982. Plans for a pre‑school were inaugurated in 1982 with Mrs. Wayne (Annette) Lussman as the first teacher. After her resignation Mrs. Paul (Anna Mae) Wamier was hired for the 1984‑85 term. In compliance with regulations for conducting preschool, a fire alarm system was installed in the fall of 1982. Because of an area of leakage in our church and connecting area, it was deemed necessary to put on a new roof. In August, 1984, plans for the congregation's centennial to be observed in August, 1985, were started. Various committees were appointed with Darwin Lussman, chairman, and Richard Stille, vice‑chairman, of the general committee. A call from Cole Camp, Mo., to serve as pastor of Trinity Lutheran Church was received by Rev. Hendrickson in November, 1984. After prayerful consideration, he accepted the call and gave his farewell sermon at St. John on Dec. 2, 1984. He had served as associate pastor from 1977‑80 and head pastor from 1980 to 1984.